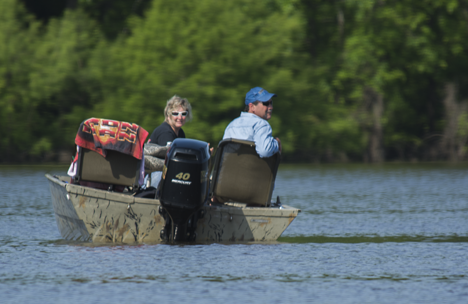 You assuredly have a relaxed idea of fishing tournament competition when you bring your wife and puppy along for the ride. It must be a good thing working well since everyone looks happy. The perfect storm of grim weather forecasts and reports of extremely high water stuck at the heart of attendance at the 2015 Felsenthal Bream Fest. Despite these untoward prognostications, weather for the Friday afternoon and all-day Saturday event May 23-24, 2015, was close to perfect. For those who did attend it was a fun event that was everything one would expect from a traditional southern festival: corndogs, funnel cakes, kid’s attractions, music, and the fishing tournament. Best of all, since Arkansas temperatures are a tad below normal this year, the mosquitos declined to attend. Click on the boy to see more 2015 Bream Fest pictures. The water was indeed high, as in a pool level of 77 feet those days versus the 65 foot normal pool level. Despite that, the water was not murky or turbulent. It was a good day to fish and enjoy the great outdoors. Before we go much further, we urge you to check out the Photo of the Week page at Corndancer dot-com and see more pictures of the event. Because attendance was down, we do not have as many pictures of anglers this year, but the Almighty favored us with other photo opportunities. To give you an idea of how great the day was, take a gander at this short video of a trip across the lake. The mayor of Felsenthal, my friend Linda Newbury is the boat driver. I am holding down the stern and shooting pictures … and this video. To clear up a common misconception, the green stuff you see on the water is not slime, scum or killer algae. 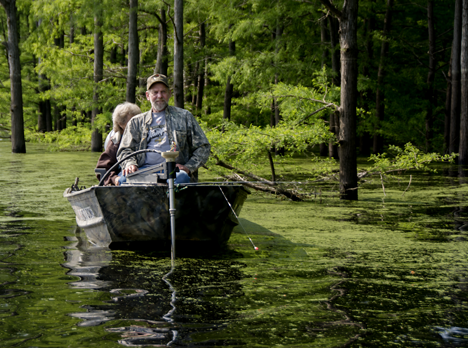 It is duckweed, a dainty little aquatic plant that just absolutely loves southern waters. 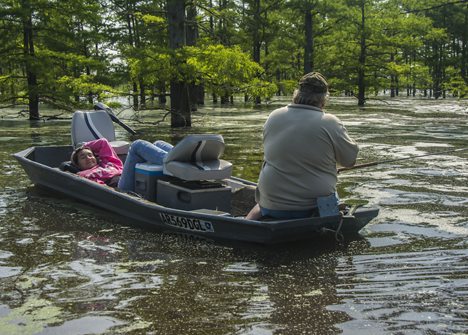 Just a moment after I shot this the lady in the back of the boat snagged a cypress limb. 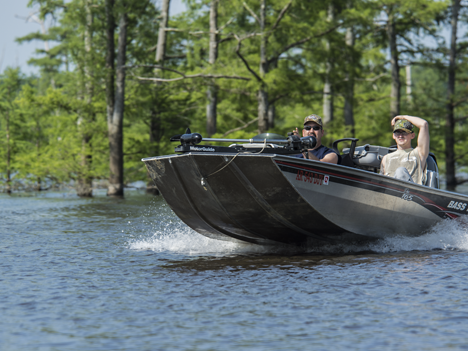 Part of the fun of tournament fishing is to push the throttle forward and let the big engine eat. Woo-hoo! The high pressure competitive atmosphere endemic to larger fishing tournament is delightfully absent at the Felsenthal Bream Fest. This one is for fun. 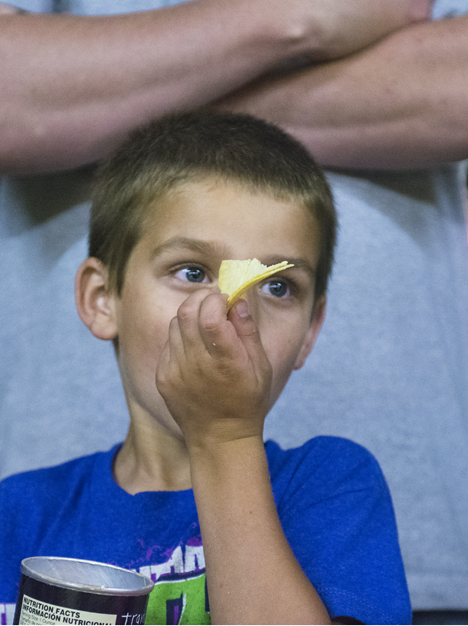 The nature of the tournament is family oriented fun. 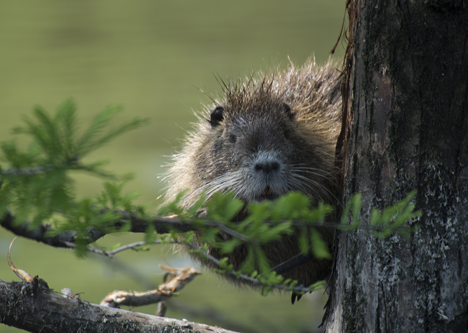 As we scoured the lake for anglers, we ran across a couple of photo ops not seen every day if you are not a denizen of Felsenthal. Somehow this dude made it up the tree, probably looking for an easy meal. 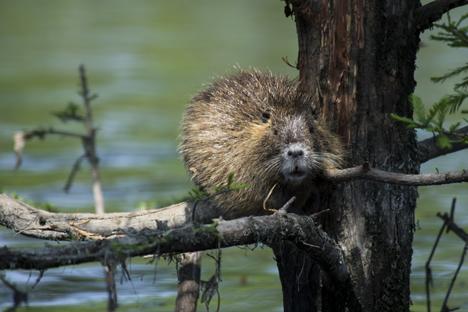 He is about 40 feet above the lake and appears to be uncertain as to how he will escape. He’s non-poisonous. 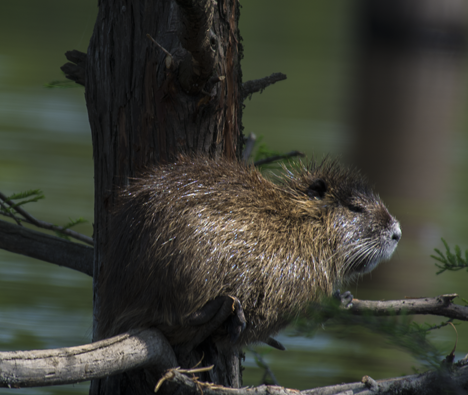 While tooling across the lake, we cruised in to the watery territory of a gaggle of nutria. A couple took a dive as soon as they saw us. The rest hung around to check us out just like we were checking them out. 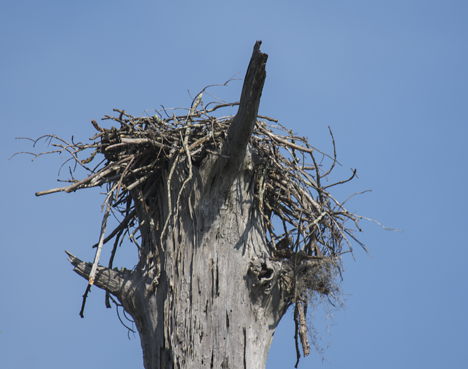 There was one who perched on a cypress limb. We gave him (or her) a good photo session. 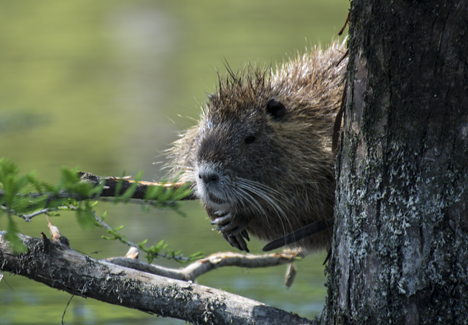 The nutria was taking rays and apparently did not oppose our presence. OK Clyde, if I ignore you, will you leave? The festival starts Friday night with visitin,’ baggo, and music. 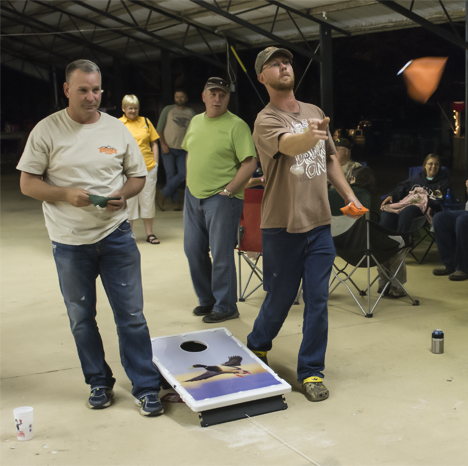 The dude who has just pitched was the numero uno baggo guy Friday night. Is the boy fascinated by Baggo and boogie? Or is he contemplating his recently nibbled Pringles chips? 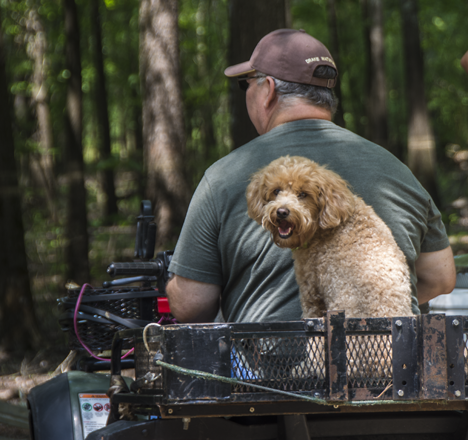 This pooch loves to ride with Daddy. The guy apparently likes dogs because he has another one in his lap. All three are temporary residents of the Felsenthal Camp Ground. If you live a reasonable distance, like to wet a hook and somehow missed the 2015 Felsenthal Bream Fest, you can reprieve yourself in a 2016. If you live too far or are providentially prevented from attendance, we will report again next year. 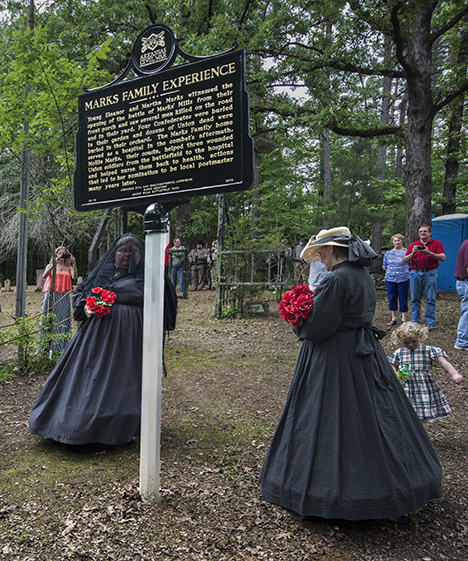 Reenactor Civil War widows place flowers at the base of the new Battle of Marks Mill historical marker at Marks Cemetery prior to the First Arkansas Infantry Reenactors firing a three-volley salute as part of the dedication of the marker. After the war Confederate widows would place flowers on the graves of fallen Confederate soldiers. After a few years, the widows noticed that there were no flowers on Union soldiers graves. It occurred to the widows that the some Union soldiers families might have no idea where their fallen love ones were and even if they did, had no way to memorialize their fallen, so they began to decorate Union soldier graves as well. That same idea is the guiding principle of memorials in and around Marks Cemetery. One hundred and thirty eight years ago, the Marks family of Cleveland County, Arkansas held their first family reunion. A week ago, they held their 138th. The first reunion consisted mainly of family veterans of the War Between the States. The most recent one included a direct Marks descendant who is a native of Australia. You kind of get the idea that the Marks family has been serious about their reunions since the get-go. You figured right. See more of the 2015 Marks Family Reunion and ceremony on the Photo of the Week Page at Corndancer dot-com. We will wait here while you look. First Arkansas Infantry Reenactors Group members fire the second of three volleys at the dedication of the new Marks Cemetery Historical Marker. The 2015 edition of the Marks family reunion coincides with the sesquicentennial celebration of the cessation of hostilities of the aforementioned war. Aside from furnishing cannon fodder for the Confederate Army, on April 25, 1864, the Marks family was unplanned host of a significant battle on their family property, the Battle of Marks Mill. The Confederates scored a big victory in the battle but it mattered for naught in the overall scheme of things since the surrender was a few days shy of 12 months away. On a local basis, the results of the battle caused the Union forces to reconsider where they would deploy troops. First Arkansas Infantry reenactors re-load for the third and final volley. As part of the Civil War sesquicentennial observation, the Arkansas Heritage Commission encouraged and partially funded new historical markers recognizing a Civil War event in each county. In Cleveland County, the Battle of Marks Mill was the choice and the location selected was Marks Cemetery. It was a good choice since the family has turned the area around the cemetery into a jam-up fine outdoor museum of the battle – and life in the mid 19th century. 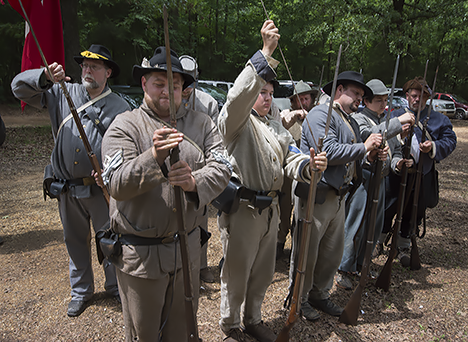 See our Marks Mill Battle and Cemetery Gallery for a good look at what they’ve done. The first Arkansas Infantry Reenactment Group of Pine Bluff, Arkansas provided its troops and family members to participate in dedicating the historical marker. You may also want to check out our previous posts on the reunion, cemetery and battle: Our first post was on June 9, 2009; our second post was on June 6, 2011. 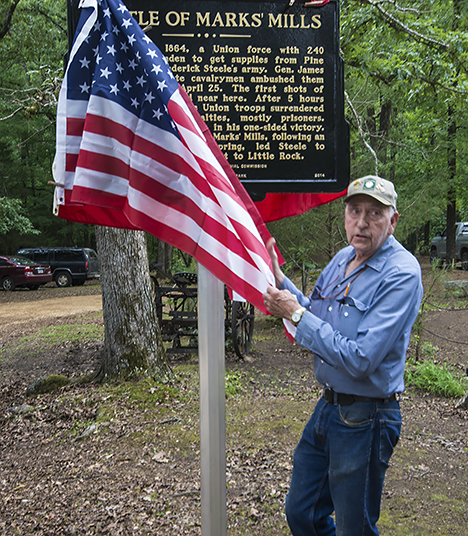 Edgar Colvin, husband of Sue Colvin, a Marks family descendant unveils one side of the new Battle of Marks Mill Historical marker at Marks Cemetery. One side provides information on the battle. The other side describes the battle impact on and actions of the Marks family and is covered with a Confederate flag. Colvin is the de-facto curator and main worker-bee of the outdoor museum which comprises the Marks Cemetery area. The memorials and markers in the park honor the memory of fallen soldiers on each side with no preferential treatment.The reunion had an international participant. 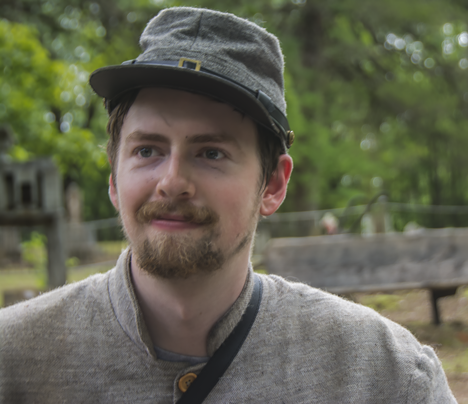 Thomas Maynard of Brisbane, Queensland, Australia, a direct Marks descendant traveled to visit relatives in Pine Bluff, Arkansas and participate in the dedication as a part of the First Arkansas Infantry Reenactors Group. We’re guessing there ain’t many other Aussie reenactors. Thomas Maynard of Brisbane, Queensland, Australia, a direct Marks family descendant and participant in the dedication ceremony as a First Arkansas Infantry reenactor. If you really want to learn how to do a family reunion in the right way, contact the Marks family. They know how to do it right. Don’t even think about keeping up with them. You are 138 years behind at the get-go. 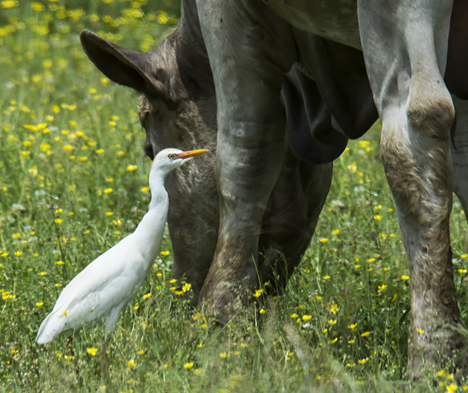 There’s about a 1,299 pound difference between the average cow and the average cattle egret, but that staggering difference does not seem to dampen their symbiotic relationship. 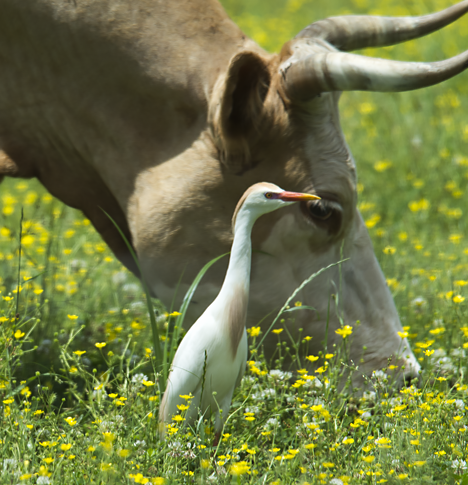 The preferred cattle egret diet leans toward obnoxious invertebrates who prefer cows as a big part of their diet. Just for grins, let’s say that the average beef cow weighs in at 1,300 pounds. With the same smirk, let’s say that a medium sized cattle egret hits the scales at around a pound. 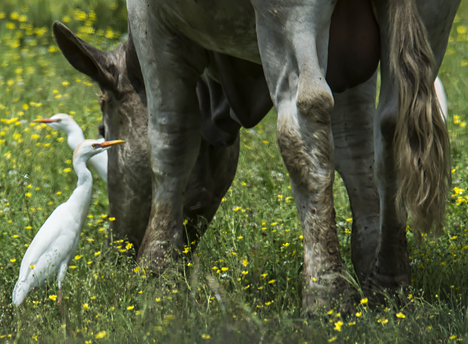 Despite that substantial difference, the two critters make pretty good partners since the bugs which cows attract make what most egrets agree to be a tasty treat. Speaking of cows, we suggest that you take a look at the Photo of the Week Page at Corndancer dot-com where we observe cows in their curious mode. We’ve noticed this phenomenon on more than one occasion and provide pictorial documentation of the behavior and make patently unscientific observations. Back to the cattle egrets. Turns out these birds are not native to the North American continent. They are natives of Africa who made their way to South America in the late 19th century and arrived in the lower 48 in the early forties. 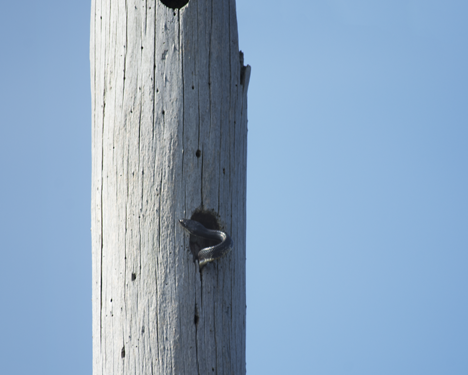 They began nesting and breeding in the USA in the early fifties. Apparently the American romantic environment was conducive to making more little egrets since they have spread exponentially. In this case, not a bad thing. This egret is sizing up a bug bugging the cow. The cow apparently considers this to be a routine and beneficial occurrence. Cattle herds are egrets favorite partners. 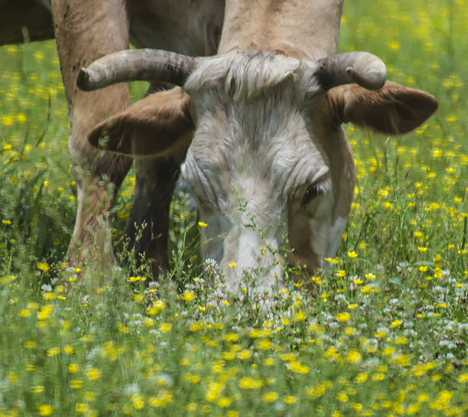 They pick ticks and other untoward and unwelcome guests from the cattle and glom down the insects that get stirred up as cattle stomp around the pasture. The new egret probably hopes where there’s one bug, there’s two. With this big ol’ cow I’m betting there’s plenty to go around. 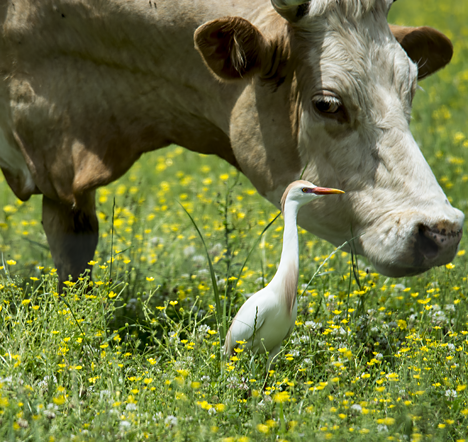 The cow and egret are eyeballing each other. 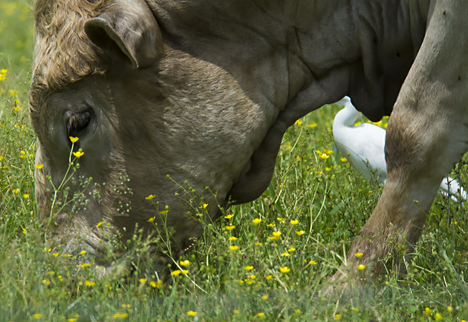 Perhaps this is the egret’s favorite cow – or vice versa. There’s no bird with this one but is is a good up close and personal cow munch-out portrait. Cattle and cattle egrets are living proof that critters as different as daylight and dark can get along very nicely by concentrating on the mutually beneficial aspects of their relationships. Perhaps we should take us a few busloads of politicians, opposing extremists, and sign-carrying stooges out to few cattle pastures to observe this behavior and see if they get any good ideas. We can dream. 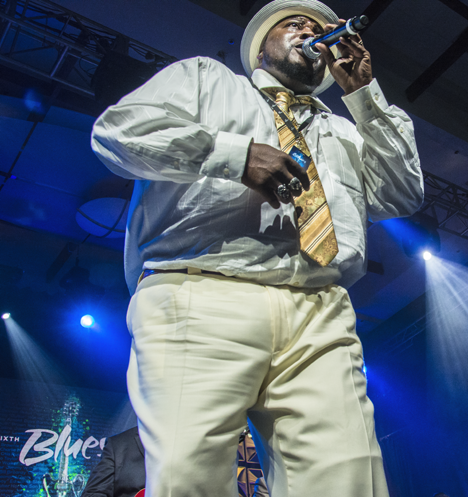 Giant Blues musician Sugaray Rayford joins the Sugar Ray Norcia and the Blue Notes for a memorable, toe-tapping, air guitar set at the 2015 Blues Music Awards in Memphis TN, May 7, 2015. The place was rocking! 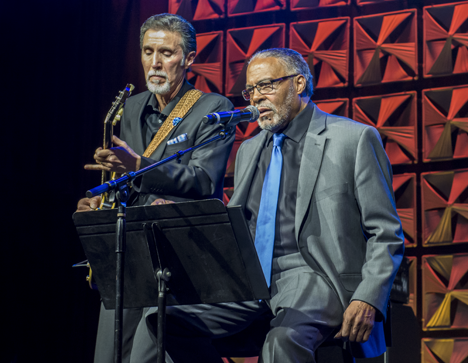 Blues aficionados of every stripe gathered May 7, 2015 in Memphis,Tennessee for the 36th Blues Music Awards. The event gets underway at 6:30 p.m. and careens headlong with alternating awards and blues music sets until 1:00 a.m. the next day. That’s a bunch of blues for blues hungry fans. It’s like a long supper of solid desserts for die-hard blues fans. I was one of those. You can also see more pictures of this event on the Photo of the Week Page at Corndancer dot-com including the Kenny Wayne Shepherd hair flare shot. He was at his best with a high-energy performance with vocalist Noah Hunt. 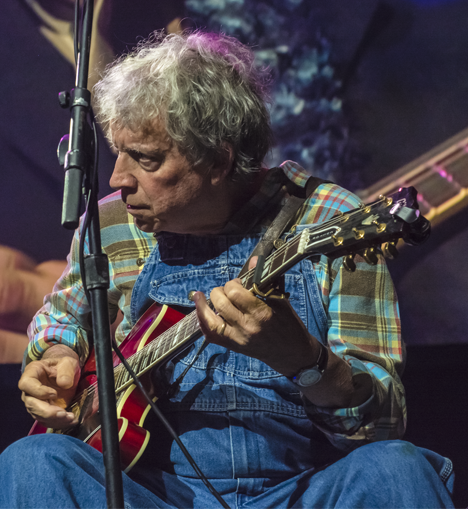 Elvin Bishop, still a tour-de-force in Blues as he pushes 73 performs with his band at the Blues Music Awards. He and his band won a bucket full of awards. Elvin Bishop fans from the mid-seventies will remember his hit single “Fooled around and fell in love” which soared on the charts. 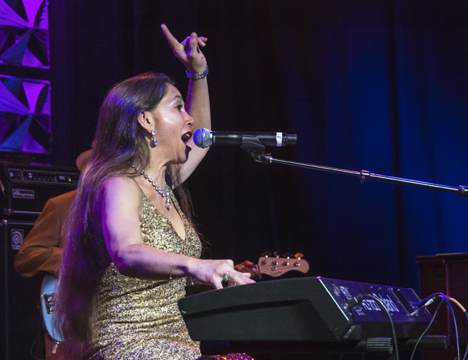 Eden ‘Little Boogaloo’ Brent from Greenville, Mississippi, lived up to her name with a high energy performance. The big smile on her face said she enjoyed every second of it. So did everyone else. 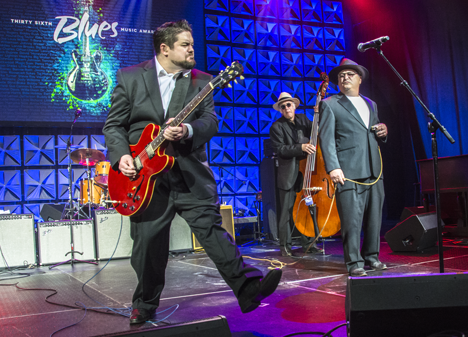 “Monster” Mike Welch kicks into high gear during the 2015 Blues Music Awards. He’s a member of Sugar Ray Norcia’s Blue Notes. 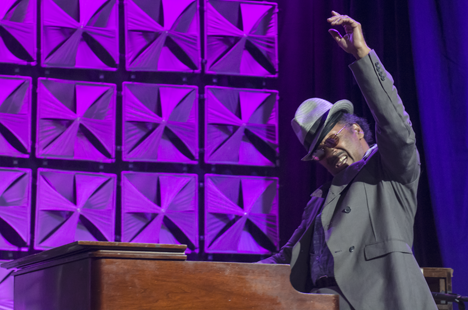 Archie ‘Huby’ Turner shows some high-handed animation as he tickles the ivories at the 2015 Blues Music Awards. Andy T. and Nick Nixon serve up traditional blues. Close your eyes and you can believe yourself to be on shotgun house front porch. Low water flow across Haw Creek Falls makes it easy for this couple to explore the large rock formation that forms the falls. Under high water conditions, what they’re doing would be life-threatening. Click the picture and see the bird and towers at Corndancer dot-com. 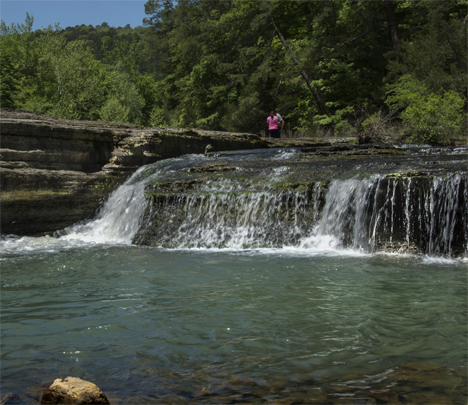 I visited Haw Creek Falls on Arkansas Highway 123 north of Clarksville on May 2, 2015 as part of a grandiose plan of seeing other locations in central Ozarks. The plan involved taking in the sights on the long route between my home in Pine Bluff and Fort Smith, Arkansas, the place of my birth. The occasion precipitating the visit was a church reunion.The plans were doomed from the get-go. I left later than I should have. The visit to Haw Creek Falls and the nearby steel bridge over Big Piney Creek were the only components of the plan that held fast. After the falls and bridge, I had to terminate the plan and make tracks to Fort Smith for the event.You can find out why despite my early self-directed grumblings, bungling the plans turned out to be a good thing; you’ll also see the pictures to prove it on the Photo of the Week page at Corndancer dot-com. The water flow over Haw Creek Falls was low. Bad news for photographers, but good news for visitors to the falls. Low water means they can walk across the large rock formations that form the foundation of the falls. Our next visit was to the Highway 123 steel bridge across Big Piney Creek. 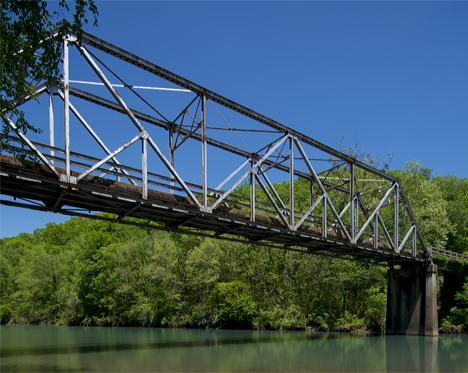 The steel bridge over Big Piney Creek on Arkansas Hghway 123 north of Haw Creek Falls is a favorite photo target. Also, the creek bed under the bridge is a favorite camping spot. It was occupied. 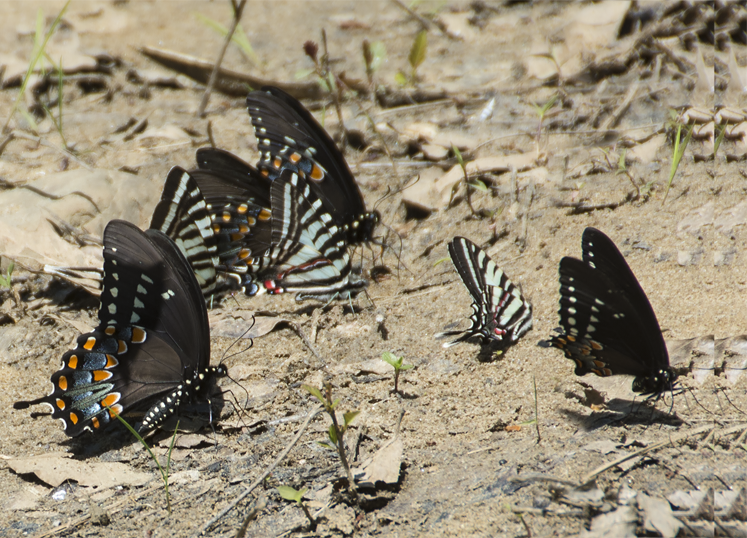 As I was leaving the creek bed under the bridge, I noticed a small butterfly convention underway. Air traffic in and out of the area rivaled Chicago O’Hare. 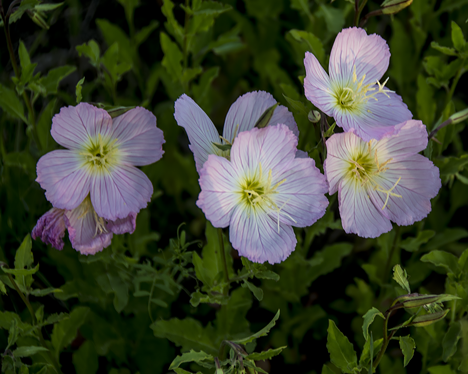 There are abundant colonies of these “pink thingies,” along stretches of Arkansas interstate highways. This is how they look when one is standing still as opposed exceeding the highway speed limit, a popular Arkansas driving habit. 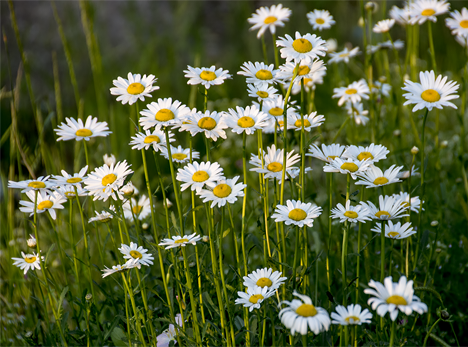 Along with the “pink thingies,” there is a substantial presence of white daisies on the interstate. These long-legged beauties are a typical growth. 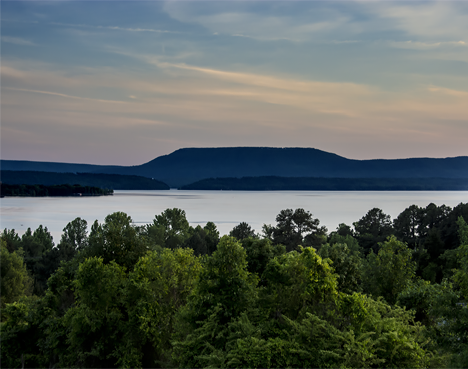 Mount Nebo west of Russellville, Arkansas, with Lake Dardenelle in the foreground is a favorite site from I-40. Subtle early evening colors add to the beauty. Free to see. Just go there. After some initial self-bashing for blowing the plans I laid out, I decided that perhaps, being cool and letting good things happen is a better mindset in less than life-changing circumstances. Which most of our “circumstances” are.